How has Myaamia (Miami Indian) clothing changed over time? Myaamia clothing – like the clothing of all cultural groups – has changed a lot over time. These changes have been affected by the availability of resources, shifts in technology, and radical shifts in our historical and cultural circumstances. In the post contact period, Myaamia people began to wear items made from various trade cloths: wool, linen, silk, and cotton. Some of the clothes made from trade cloth were reserved for special events like treaty negotiations, funerals, and community dances. Other items, like cloth shirts, were worn more frequently. These newer materials were used in combination with hides, which they continued to wear for leggings and moccasins. 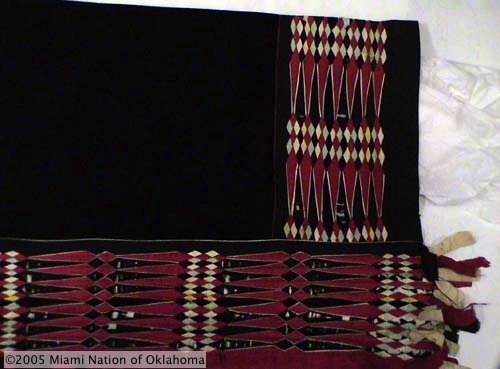 Myaamia people also perfected a unique form of ribbonwork that created complicated geometric patterns through the layering and cutting of silk ribbons. These ribbonworked strips were appliquéd onto moccasins, leggings, woolen wrap blankets, wrap skirts, and bags. You can see a few examples of the Myaamia style of ribbonwork by searching “ribbon” at the Myaamia Exhibit home page. mahkisina – silk ribbon, wool, and beads on hide. From the early 1800s collected in Indiana. This pair of moccasins is currently held by the Cranbrook Institute of Science. If you are interested in seeing more images of clothing from the early 1800s, see the book: “Indians and a Changing Frontier the Art of George Winter” (see endnotes). You can also find many of Winter’s paintings online here and here. You can see other examples of the clothing in paintings by another artist – James Otto Lewis – by searching “Miami chief” on the Indiana Historical Society’s images database. By the late nineteenth and early twentieth centuries Myaamia people’s daily clothing did not differ much from the settlers who surrounded them. For an example of this, see the images of our leaders who visited Washington D.C. in the late 1800s by searching “Miami Indian” on the Smithsonian’s Collections Search Center. 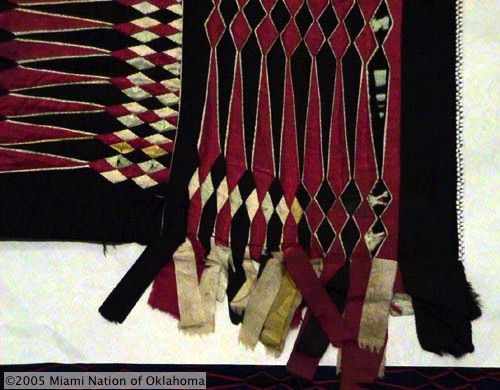 However, for special occasions like weddings, funerals, feasts, and public performances, Myaamia people continued to wear the combination of wool, cotton, and hide decorated with ribbonwork that was developed in the trade era. 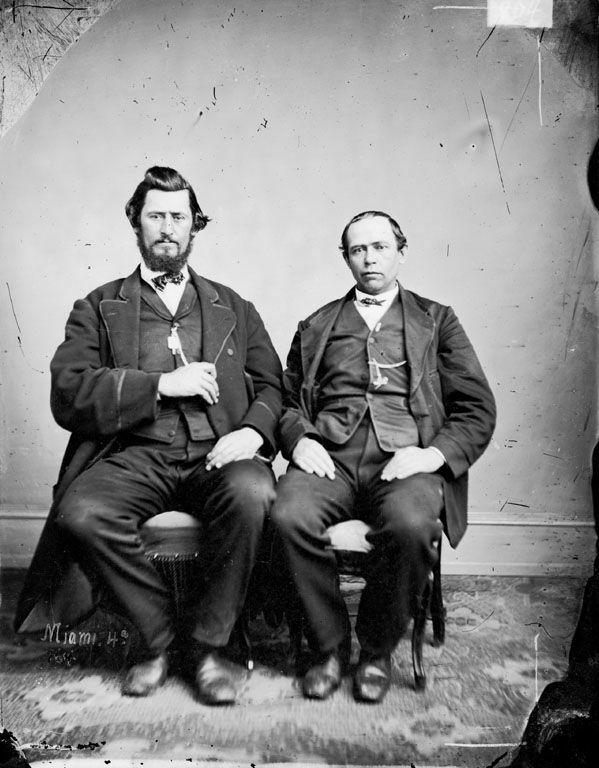 J.B. Roubideaux (left) and David Geboe (right) were photographed while visiting Washington D.C. in the late 1800s. In this photo, their clothing was probably representative of their “Sunday best,” and it would have looked similar to other 19th century visitors to the capital. Today, the daily clothing of most Myaamia people does not differ all that much from our neighbors. But on special occasions like social dances, political gatherings, weddings, funerals, parades, and other community gatherings many Myaamia people still wear a combination of wool, cotton, and hide decorated with beadwork and or ribbonwork. These full sets of Women’s and Men’s Regalia by Larry Daylight represent the style that evolved during the fur trade and continues to be utilitzed by Myaamia people. 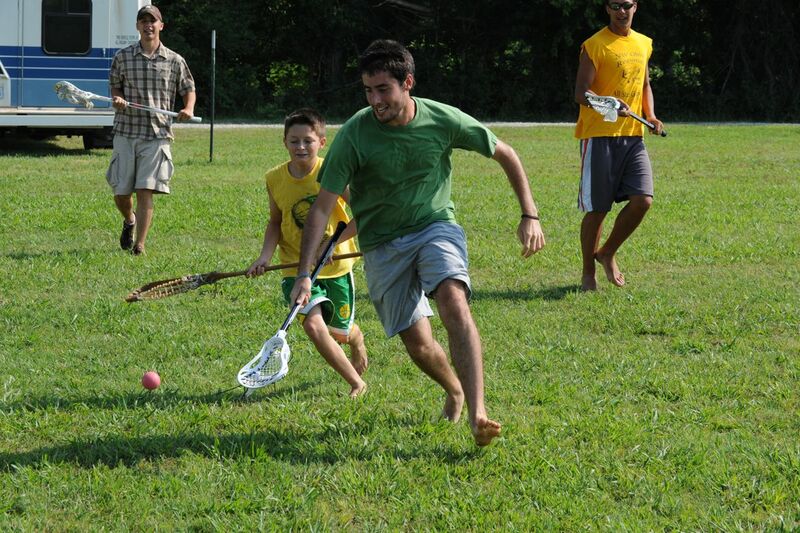 Lacrosse game at the 2009 Eewansaapita Program – today the t-shirt is just as common among the Myaamia as it is among most North Americans.
. For examples of dress associated with special occasions see Christian F. Feest et al., Indians and a Changing Frontier: The Art of George Winter (Indianapolis, IN: Indiana Historical Society, 1993), Plates 7, 47, & 43; and James Otto Lewis, The Aboriginal Port Folio, or, A Collection of Portraits of the Most Celebrated Chiefs of the North American Indians (Philadelphia, PA: Lehman & Duval, 1836), Plates of Little Wolf, Brewett, Francis Godfroy, Richardville, Mi-a-qu-a, Speckled Loon, Na-she-mung-gwah, and the Son are all examples of finery worn for a treaty negotiation. For examples of daily wear in the 1800s see Feest, The Art of George Winter, Plates 1, 6, and 45. Sorry but, Roubidoux is on the left and Geboe is right. neewe eeweemilaani, no need to apologize. The only thing worse than a mistake, is an uncorrected mistake. I appreciate the help. Daniel, it’s nearly a universal human tendency to want to fit in, or blend in, with the group that you live with. 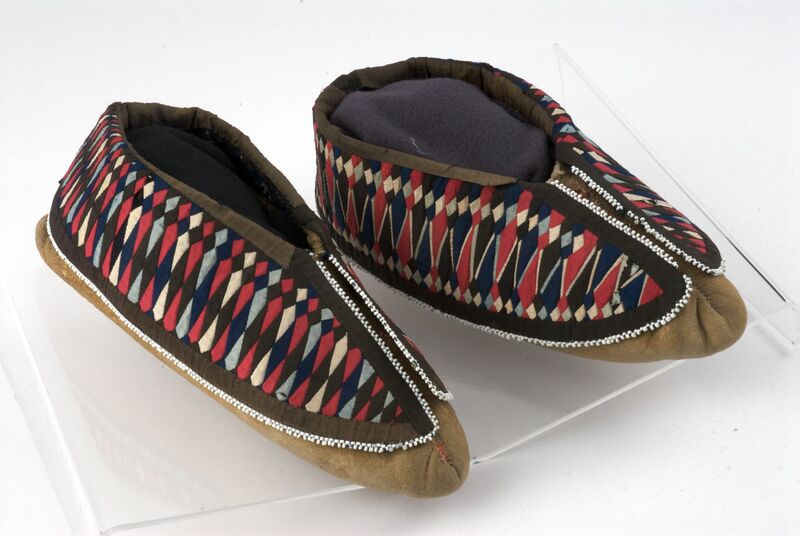 But after the War of 1812, Myaamia people continued to dress to blend in with their own communities, which still maintained a high degree of separation from American communities. Most of the references to the appearance of Myaamia people in the 1830s and 1840s describes that while they wore trade clothing and trade cloth, they wore these items in ways that marked them as distinctly Myaamia. 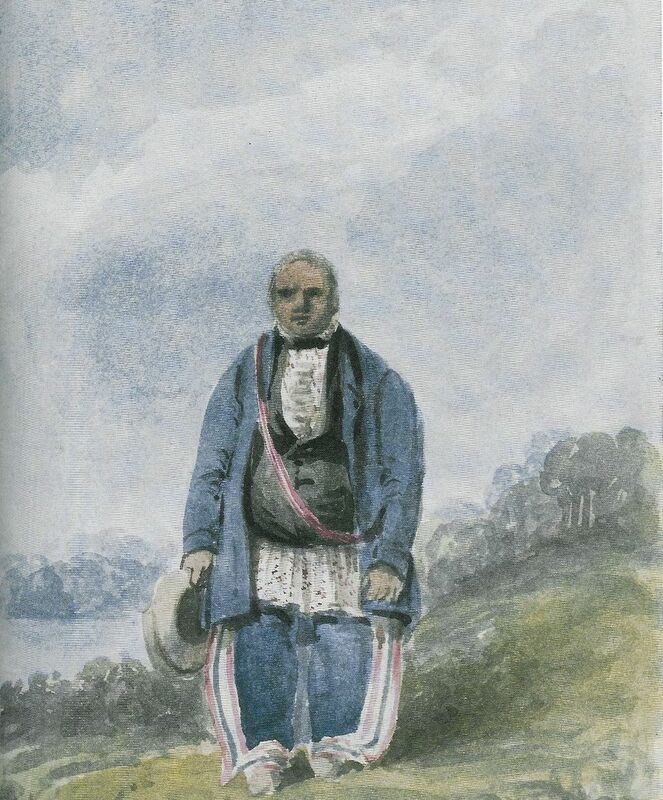 Americans recognized their dress as “Indian.” For example, Akima Pinšiwa (Chief Richardville) continued to wear leggings and moccasins to treaty negotiations all the way until his death in 1841. 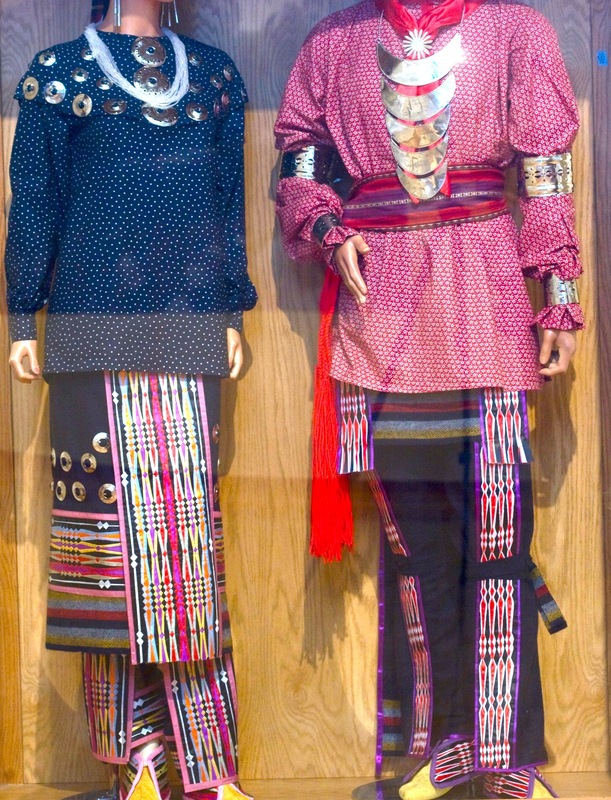 Based on the evidence, it seems to be in the 1880s and 1890s that Myaamia people began to blend in more with American society in terms of clothing. This is the period of allotment – the division of tribal reservations and family reserves into individual parcels of land. As Myaamia people began to farm in a manner similar to their American neighbors, they also began to look like them in terms of the clothing they bought and made. Despite these changes in land use and dress, the community continued to maintain cultural and political separateness from their American neighbors.